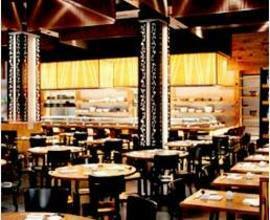 Opened in 2005 Nobu Dallas at the Crescent Court is Nobuyuki Matsuhisa�s signature southern outpost. The modern river stone dining room is highly urban featuring an onyx sushi bar and birch paneling, giving it the feel of it�s mother restaurant Nobu New York. The menu boasts all of Nobu�s signature�s, from the Black Cod with Miso to Yellowtail with Jalapeno along with some Texan favorites like Tuna Tataki with Cilantro dressing seared Toro with Karashi Sumiso, Scallops with Jalapeno Salsa and Ranchero Rib Eye Steak.